Having spent many happy hours watching David Letterman’s Late Show Top Ten Lists, I thought I would compile my own version! 10. Cafes at garden centres tend to be more relaxing than those at supermarkets. Let’s be fair, their wares to lend themselves to a more convivial atmosphere. They can include fountains, foliage, colourful plants and I have even seen one with a peacock. 9. Visiting gardens gives you the opportunity to wander around someone else’s property. You can get ideas, experience their lifestyle, and enjoy the day out – and maybe peer in the windows. Apart from TV programmes, it is very rare to find someone, who is not a friend, who will welcome you into their house. 8. 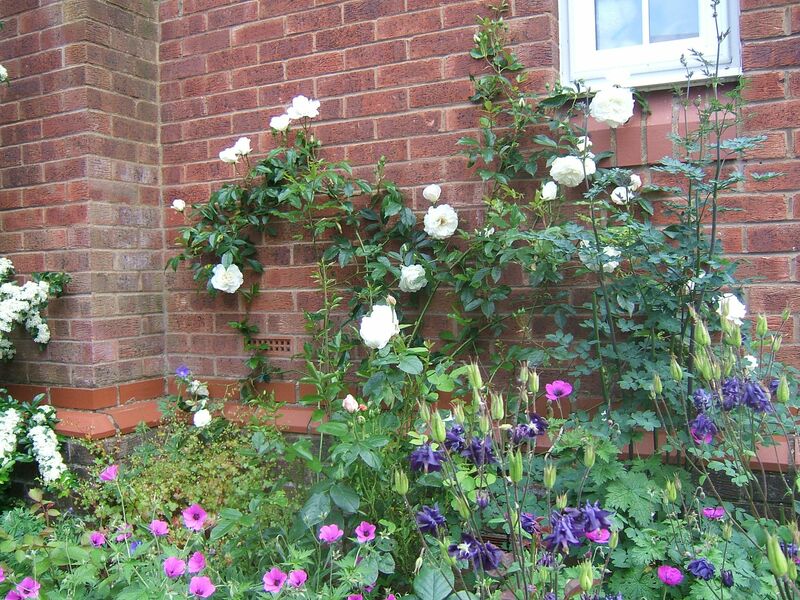 Gardening is all about taming nature – you can prune plants to go where you want, provide them with conditions they need and they will reward you. The humans, and to some extent the canines, you share your house with will have their own opinions on life! 7. Whilst both gardening and housework have a wide range of tools to make jobs easier to do, gardening tools tend to be much easier to use – when did you last see a trowel or secateurs with a detailed instruction book? 6. Your body sometimes decides that you have done enough work in the garden and it is now time to relax and sit back and enjoy the fruits of your labours. 5. You tend to use more calories gardening than on housework. Obviously it depends what you are actually doing, but according to CalorieLab.com, most household chores range between 100-200 calories per hour, whilst WebMD.com gives calorie values of 200-400 per hour for general gardening while heavy work can be much more. 4. 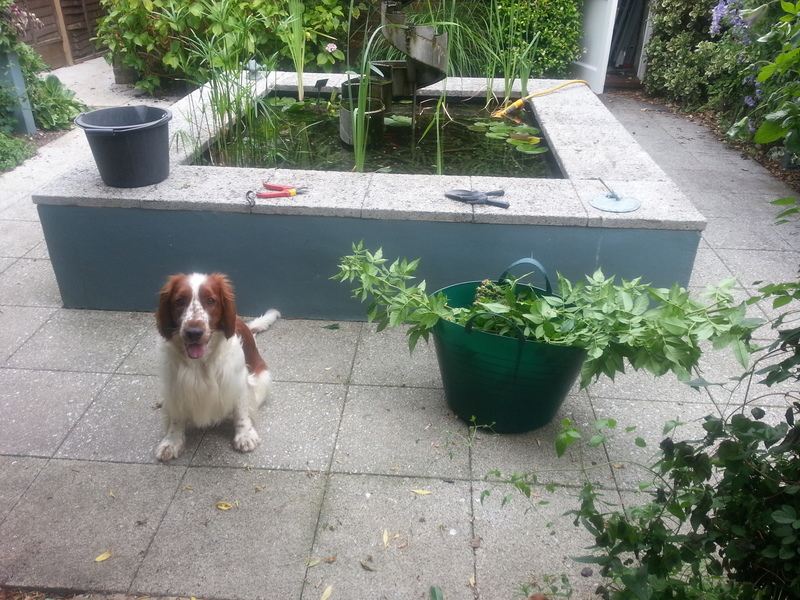 Sometimes family members want to help you with the gardening – though canine help isn’t always appreciated! This rarely happens with housework. 3. When gardening, you see the seasons coming. You have the promise of the future. Indoors, the only event that has a major impact is Christmas. 2. Gardening means you are outside and can feel the sun on your back, the rain coming down or the chill of the evening. Indoors, you can fix the thermostat for a constant temperature. 1. Weeks and months after you have worked on an area in the garden, it looks better than when you did the work. Indoors, the moment when something looks its best is the second after you have finished the work. We always think of winter as a time to see the structure of a garden, but I would argue that few of us tend to spend time out in the garden in the cold days of winter. Rather, it is as winter gives way to spring that we venture outside for longer and actually look at plants for longer than a few seconds. 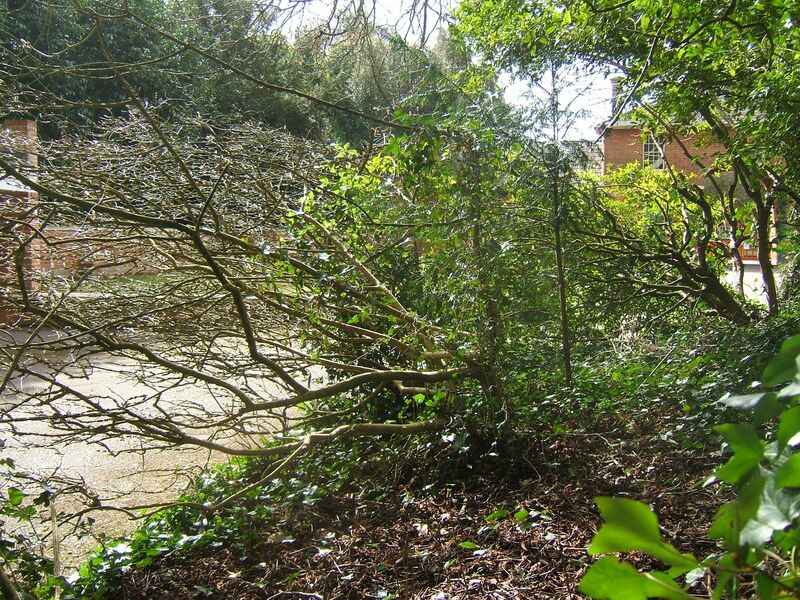 I see this hedge at work every day and ever since I recognised it as Euonymus europaeus, I have kept an eye on it as I have the same plant in my front garden. Though I have to say this plant is much more mature than mine. Last week, I was looking at the Euonymuos closely and looked through the external twigs / branches, to the trunk behind it. I suddenly realised that what I thought was a hedge was actually just one plant. Seen from the back, this becomes very apparent, but I had never before looked past the clothing of the plant to actually look at the structure behind it. Last year, my garden was totally neglected due to my hip problems so now I have to get the garden back under control! Obviously the structure is still there – a year isn’t enough for nature to totally take over, but oh boy have many of the plants had a field day :). There is a saying that a weed is just a plant in the wrong place – well, I have a lot of weeding to do. One plant that is only now mature enough to need confining to its allotted space is on called Muehlenbeckia complexa. When I last opened the garden, a number of people asked the name of it and it certainly is very dainty and fills it’s allocated spot beautifully. 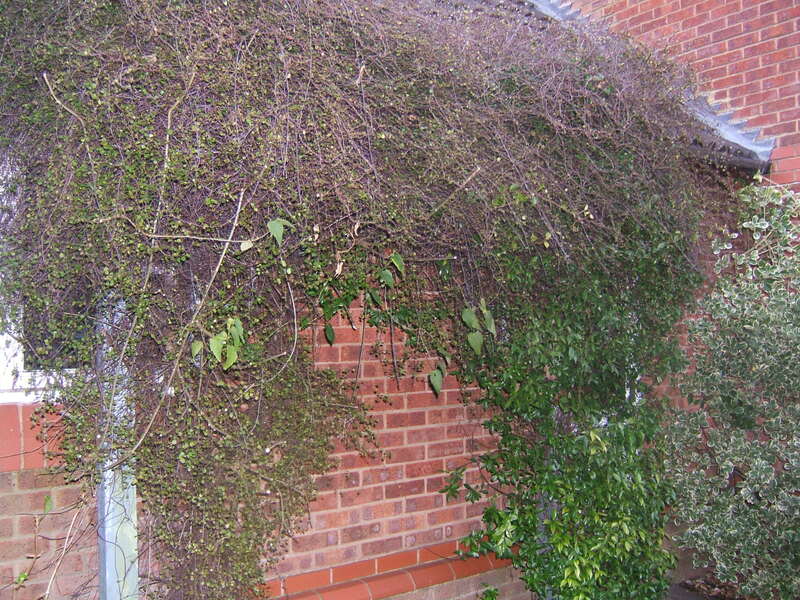 But if only I had looked in Wikipedia and seen its common names, I might have been more wary as they include maidenhair vine, creeping wire vine and lacy wire vine. As I worked my way around the garden, clearing one area at a time, I made great progress until I came to the area by the pond where the Muehlenbeckia complexa is planted. I realised that it had decided to make an airborne attack on the hydrangea next to it, but I was not anticipating what I found at ground level. Along the wall and at the path edge, I found what looked like a bundle of wires. The bundle must have been at least 4 inches in diameter and probably contained well over 100 “wires”. Luckily, they hadn’t made too many attempts to root and so could be removed, but it did take quite a while. 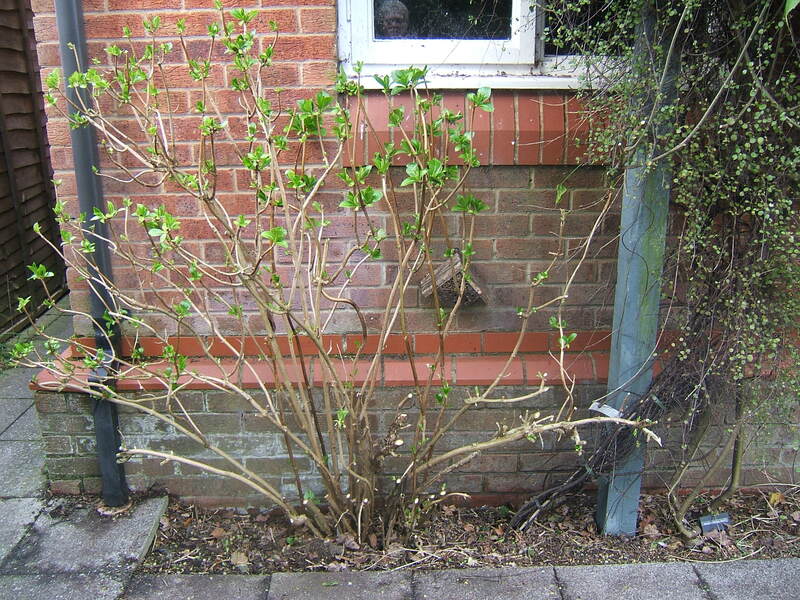 Hydrangea returned to its fan shape and Muehlenbeckia complexa controlled – for now! 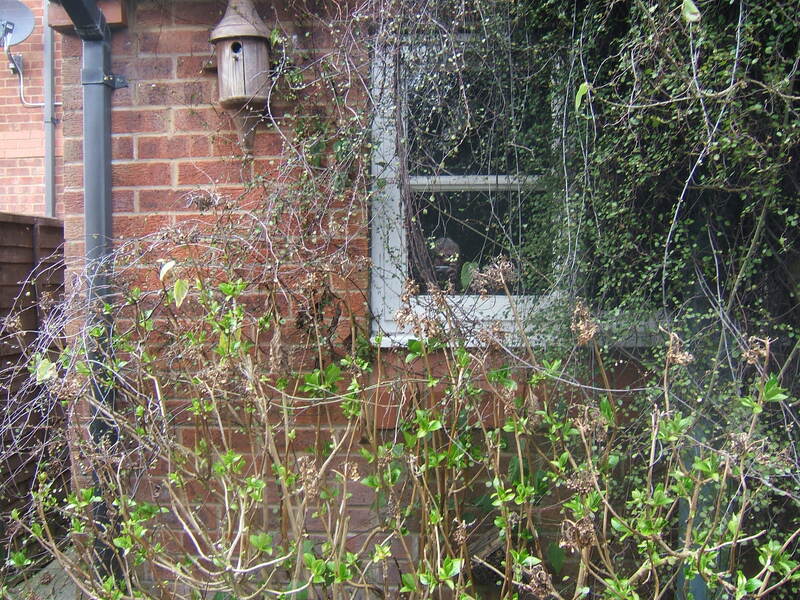 Once that was done, then I could get on with my planned job of fan pruning the hydrangea. 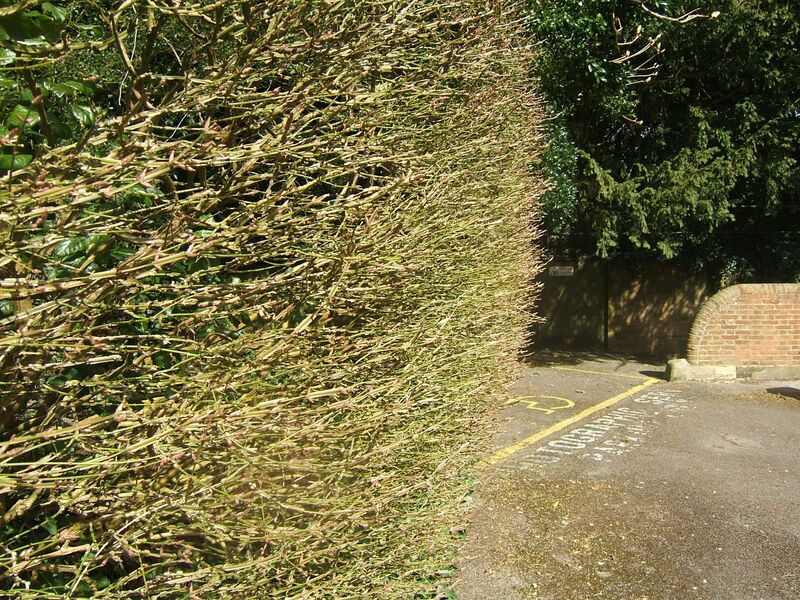 I really like this way of pruning them, which I first saw at an office I was working at, as allows the hyrdangea to fit into a narrow space and also add a structural element. So, that is it for this weekend. The clocks have gone forward and gardening begins again in earnest :). I feel really bad that I haven’t posted for some time. The truth is that I have hardly been out in the garden and so have had no inspiration :(. This is because I have become increasingly incapacitated by hip pain. 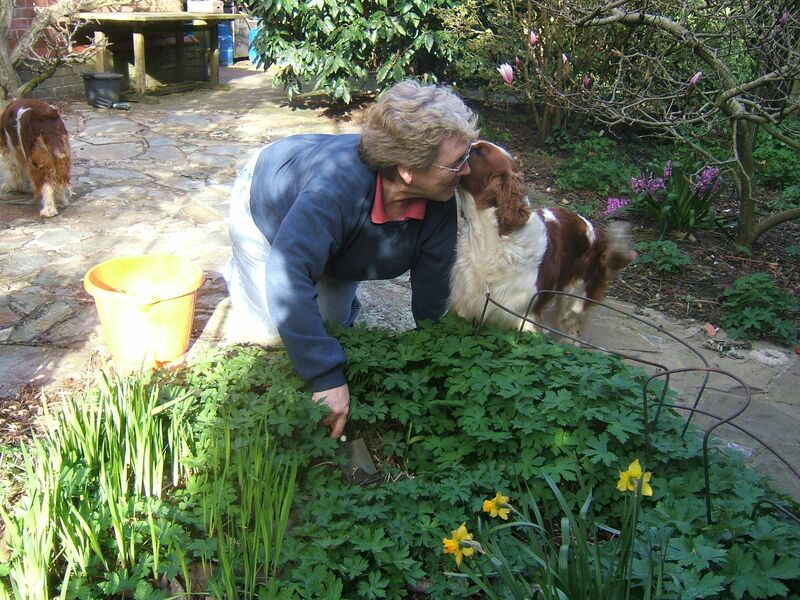 Well, tomorrow is the date for my second hip replacement, so normal service should be resumed early next year as I become fit enough to garden again. 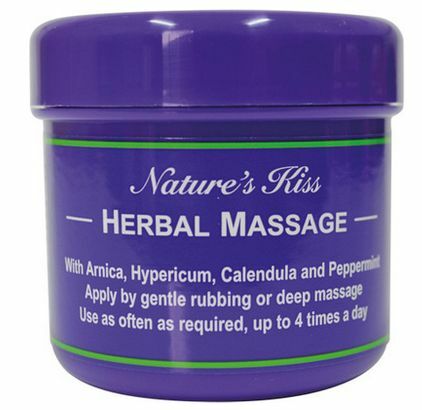 I have however found a number of ways of coping with hip pain which I have detailed in a focused website – hiptips.me. 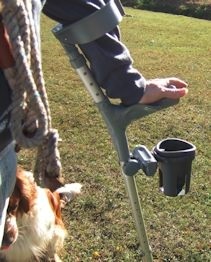 Probably the tip that I am most proud of is my solution for the eternal problem of how to carry things (drinks in particular) when you have crutches.